Who would have expected this? The story just has to be told. 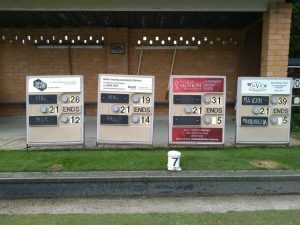 Malvern (Div-4) top-side hosted Murrumbeena (24/11) who had only one win coming into round 7, would absolutely wallop them at Coonil Crescent by 81+ shots (117/36) & take all 18 points for the match. In spite of 2 days of continual showers, the green preformed amazingly well, running at around 12 seconds. 48+ shots to 8. A blistering & most satisfying win. That adds a 4th win to Malvern’s report card, reading 4 -wins, & 1-draw from 7 outings & now locks us into 2ndplace on the ladder, behind St.Kilda. 2 rink performances were a standout & rarely ever achieved, regardless of an oppositions position on the ladder. 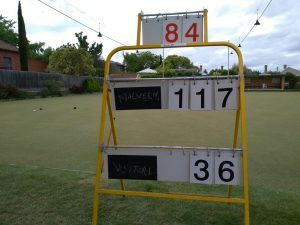 absolutely blitzed the Murrumbeena rink to win 39/5, losing only 4-ends in the process. weren’t far behind winning 31/5. won 28/12 after scoring 18+shots to 3 after the break. Round-8 next Saturday sees the Malvern top-side visit Sandringham who have scored 3-wins. Malvern’s 2nd side were unfortunately given a walkover by Richmond Union. but did enjoy a solid practice match session amongst themselves on our home turf. Hi! I'm Ed Payne - I have been a resident of Malvern for the past 35 years (my whole life) and have only been bowling for a very short while. I've gone the "whole hog" and jumped in as the Secretary of Malvern Bowls Club and now I'm doing a little work on the website. I hope I can help YOU to get the best out of this site, as it belongs to YOU, the member. So please don't hesitate to suggest changes and additions - I'll always listen.